The qualities of human nature described in “Thinking, fast and slow” are already known to all of us at some level. We are all taught in society to believe in the rational, thinking human being as distinct from his animal peers, yet at this book excellently details, there are plenty of ways in which our seemingly rational decisions can be bent and perverted by various forms of bias. Daniel Kahneman details these two seemingly incongruous facets of our nature as two ‘distinct’ halves: System 1 represents our autonomous, unthinking, reflex and subconscious reactions, whereas System 2 is that logical, calculating being we consider ourselves to be. 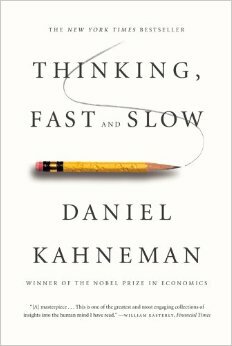 Much of the relevant research covered in this volume was pioneered and conducted by Kahneman and his late colleague Amos Tversky, to whom this volume is dedicated. At root, the interplay between System 1 and System 2 rests upon the fact that we are naturally adapted to choose the path of least resistance, i.e. we make decisions which require the least amount of effort. Whilst this does not necessarily mean that we (or our System 2s) are not making the decisions, it does sometimes result in our System 2s acting merely as auditors of the information being passed on by System 1. If that information appears to fit the facts, it is taken at face value, unchanged and unedited. As a result, this ‘quick thinking’ leads to errors and biases of which we are almost entirely unaware. As a summary of decades of research, the book deals with a lot of extremely interesting aspects of these decision-making processes. Each of these is handled in turn and alone, although many of them are linked and could in some ways a different impressions of the same phenomenon. For example, an issue known as ‘anchoring’ is investigated, a truly staggering anomaly in which a decision can be influenced by an entirely unrelated and random suggestion placed before us: Kahneman provides us with the example of a set of experienced judges whose sentence decisions were seen to be tilted by the results of a dice roll. There is a lot of ground to summarise within these pages, and Kahneman does an excellent job of presenting some fairly mundane experimental data in a way in which it becomes clear to the layman, how insightful and potent the results truly are. The first half of the book in particular is an extremely fluid read, the experimental data plays second fiddle to clear evaluations of both experiments and their results. Whilst some aspects are dealt with purely theoretically, others are highlighted in terms of their effect on certain people in society, and Kahneman makes no bones about pointing out the absurd decisions of stock brokers, businessmen, or even his own psychology students. Another nice feature of the book is that many of the chapters start with a little test which readers themselves can do, becoming a part of the experiments, easily the best way to highlight precisely how ‘un-rational’ our minds can truly function. The overarching irony of this book is that it seems to want to prove one of the theories explored between its very covers, that of our ‘experiencing’ and ‘remembering’ selves. The evidence suggests that even if the vast majority of an experience was born with enjoyment, if the end was tainted, our memory of the positive experience will be overridden by the negative. Unfortunately, this book is guilty of the very same: it opens beautifully with some lucid and unhampered prose, plenty of example tests and real world extrapolations, occasional anecdotes and witty asides. Yet the latter half of the book feels like it was written by a different Kahneman or for a different reader; it is turgid, almost lethargic, sticky with academic language, no longer peppered with as many human insights, and devoid of example tests for the reader to take part in.